Today we’re talking to Shelly Chalmers. I met Shelly through the Golden Network, the organization that allows Golden Heart® finalists to stay in touch and support each other. Shelly is the Communication Chair, which means she’s the cheerleader who’s always posting little motivational memes in our Facebook group and reminding us to keep pursuing our dreams. She also does a great job of modeling that behavior. After becoming a finalist in 2014, she went on to publish her first book, Must Love Plague, last October. You can read a sample chapter here if you’re interested. Her second book, Must Love Famine (are you seeing a theme here?) comes out in March. How adorable is this cover? Question 1: On Jenny Crusie’s Argh blog, she recently asked if anyone had ever bought a book just for the title. I responded that I bought Must Love Plague for the title alone. Where did you get the idea for this title (and this book!)? Thank you, Jeanne, I’m glad it caught your eye. I’ve definitely bought books for their titles! The idea for the book, the series in fact, was the synthesis of a few different ideas. One was the idea of a town for paranormal creatures, a sanctuary where they were free to let their weirdness loose, safe from the “Normals” or people without magic. After an initial book about an island sanctuary, I decided instead to set my town in the sea of the prairies, isolated by miles of wheat crops and forest—coincidentally the kind of place I live. This allowed me to base the town of Beckwell on my local small town, although all the bad things I made up…and I’m fairly certain Loki doesn’t actually live there. The girls and the four horsewomen of the apocalypse were another idea entirely. I liked the idea of four friends who were inseparable during high school, but went very different directions after graduation. I’ve also been intrigued by turning the conventional four horsemen upside down, and what better way than if they were women in this paranormal sanctuary, about to gain their abilities whether they want to or not? Question 2: According to your website, you’re in search of an agent. What do you feel having an agent will add to your career? I’ve been writing and submitting since I graduated high school, so when I started, traditional publishing was the only viable route. The industry has changed a lot since then, and while I appreciate the freedom indie publishing has offered me, it wasn’t the route I’d planned to take, and I’d still like to become a hybrid author (and not just because it sounds like I could be a werewolf.) I feel an agent is a way to help me achieve these goals, as they could help me navigate those contracts and make sure I’m not violating competition clauses between my self-published and traditional work. I look at an agent as a business partner with more experience in areas I lack, but who could also help me plan and further my career. Question 3: You have a craft blog, Craft Room Chronicles, that includes some pretty amazing stuff—dollhouses with tiny furniture, polymer clay figures, family crests and miniature houses, papier-mâché vases, quilts. Although your materials vary, one common theme runs through most of your crafts–a sense of fantasy. Talk to us about the inter-relationship of your craft-work and your writing. Interesting question! And thank you for checking out my creative work. So the short answer is that both my crafting and writing are creative outlets, and I’d go crazy without them. Crafting is what I often do between writing projects; if my hands are busy, it partially occupies my brain, which allows me to think more clearly. The longer answer is that there didn’t used to be as much fantasy in my crafting, just like there didn’t used to be magic and the paranormal in my writing, but maybe magic is kind of like glitter: it gets everywhere before you know it. I truly believe that the world needs more magic, by which I don’t mean witches and unicorns and the like (even though those are fun too), but the sense of wonder, hope, and possibility that’s at the heart of magic. The more magic and paranormal took up residence in my writing (I do tend to lean toward the urban fantasy end of paranormal romance), the more it seemed silly that it wasn’t in my crafting projects. And that there wasn’t story in my projects as other artists seemed to have. So, fantasy increased in my projects, with my latest being the miniature fantasy house / shop I’ve been planning in my head for years that I finally built in 2017. In my own way, if only in my house and for my children and those who know me, it means I get to add more magic to their world. Shelly Chalmers writes stories that run the gamut from Regency shifters to space opera. All include a touch of magic, a sense of humor, and a dab of geek. A member of RWA® since 2008, she was thrilled to final in the Golden Heart® Contest in 2014. She makes her home in Western Canada, where when not reading, writing, crafting, or hunting unusual treasures and teapots, she wrangles a husband, two daughters, and two nutball cats. 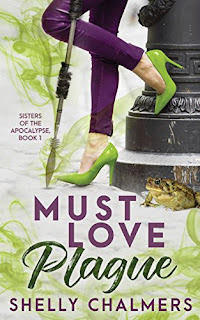 Her first book, Must Love Plague, came out in October 2017, and Must Love Famine will be available in March of 2018.